The holidays are a time of good cheer and surprises. How true that was this year for Hartwell Studio Works and our Holiday League promotional campaign! 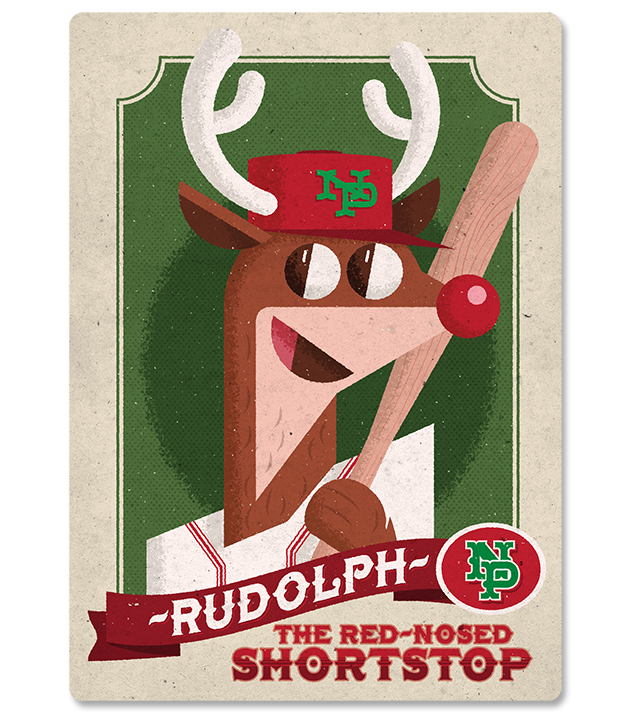 After the successful launch of the Holiday League with last Christmas’ North Pole Reindeer email promo, we thought it would be fun to follow up this year with a baseball card for the Reindeers’ 2013 MVP, Rudolph the Red Nosed Shortstop. 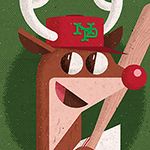 Enlisting the help of Jay Rogers of Jayro Design for the card illustration and Sean Forman of Baseball-Reference.com for Rudolph’s official stats, Rudolph was introduced to the world on December 17, 2013. Except that the internet has a funny way of doing its own introductions! Sean made Rudolph’s Baseball-Reference player page live on Monday, December 16. Thanks to Sean’s enthusiastic readership, word got out very quickly about this quirky and fun holiday treat. The next thing we knew, Twitter was aflutter with Rudolph tweets, and by 2:00 PM that afternoon, I was contacted by the New York Daily News inquiring about doing a story on our star player. Say what? What followed can only be described as amazing. Rudolph went bonkers viral for the next 48 hours, with stories, tweets, and mentions across the world wide interwebs. Along with the New York Daily News story, Rudolph got the attention of USA Today, Sporting News, Peter Gammons, MLB.com, FOX Sports, NBC Sports, and ESPN’s SportsCenter, among others. What a way to celebrate the holidays! Hats off to Jay Rogers and Sean Forman for their generosity of time and effort in making Rudolph such a stellar success. Be among the first to receive the next Holiday League promos as well as the latest news from Hartwell Studio Works by signing up for our email newsletters here. Best wishes for a great rest of the holiday season. We’ll look forward to seeing you in 2014!